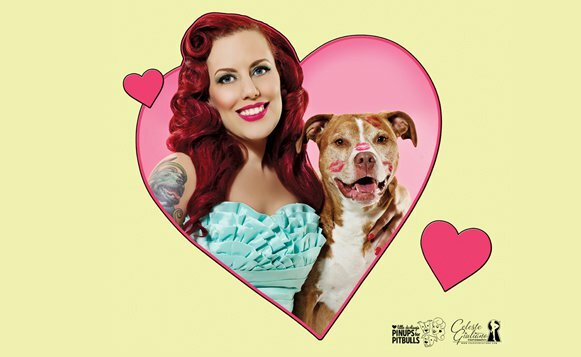 Founder of the non-profit education and advocacy group Pinups for Pitbulls (PFPB), Deirdre “Little Darling” Franklin, understands the power that pinup artwork holds in the American psyche. When she began her grassroots non-profit organization in 2005, the question became how to educate a wide enough audience to dispel the myths and misconceptions about a group of breeds (“pit bulls” are roughly 12 dog breeds lumped into one title) that have been a popular part of American culture since the early 20th century. In her book, Little Darling’s Pinups for Pitbulls, Franklin probes, “Who doesn’t love to look at beautiful women paired with adorable pups? Pinup girls attract all kinds of people from many different backgrounds.” The answer was to create a pinup calendar that features beautiful women with their furry family members or adoptable pups who may need some extra exposure to find their forever family. Most of the pets featured in the calendar are shelter mixes who became loving, devoted family members – and PFPB believes in fighting to protect your family through the beauty of art and advocacy. Pinup art has been popular for close to a century, with its golden era occurring during World War II. Famed artists such as Gil Elvgren and Alberto Vargas celebrated the female form through colorful and flirtatious paintings, implying both innocence and excitement. While painting beautiful women was not a new concept at the time, early pinup artwork often depicted beautiful girls-next-door in everyday day situations with only the slightest hint of the tantalizing possibilities each young lady possessed. These images gave hope to countless young men during World War II and became an indelible piece of American history and popular culture. What better way to celebrate one of America’s most popular, though currently misunderstood, dog breeds than by embracing the art of pinups?